Poll the jury | Jon Katz, P.C. Before going to trial with or without a jury, it is critical to have a good trial checklist. For jury trials, a critical part of that checklist is to have the jury polled in the event of an adverse jury verdict. 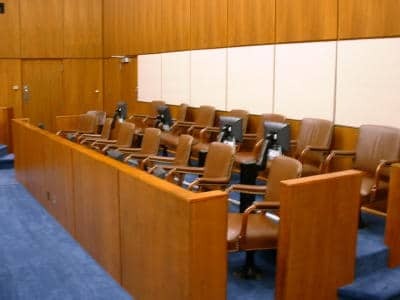 Every criminal defendant has the right to require that s/he not be convicted unless his or her request is fulfilled to have each juror asked if the foreperson’s verdict is the individual juror’s verdict. See, e.g., Maloney v. Maryland, 17 Md. App. 609, 304 A.2d 260 (1973). THE DEPUTY CLERK: Ladies and Gentlemen of the Jury, are you agreed of your verdict? THE JURY: Yes, we are. THE DEPUTY CLERK: Who shall say for you? THE DEPUTY CLERK: Mr. Foreman, how do you find in the Criminal Trial 05-0520X, State of Maryland versus Darren Joseph Tate, Count One: Do you find the Defendant not guilty or guilty of child abuse by a family member? THE DEPUTY CLERK: Count Two: Do you find the Defendant not guilty or guilty of fourth degree sexual offense? THE DEPUTY CLERK: Count Three: Do you find the Defendant not guilty or guilty of second degree assault? THE DEPUTY CLERK: Ladies and Gentlemen of the Jury, harken to your verdict as the Court hath recordeth it. Your Foreman sayeth, in Criminal Trial 05-0520X, the Defendant is guilty of child abuse by a family member, not guilty of child abuse “ or fourth degree sexual offense and not guilty of second degree assault. And so say you all? THE COURT: Thank you very, very much, Ladies and Gentlemen. Have a nice evening. We won’t call you again for three more years. Thank you. THE COURT: Anyone need a ride to their car or anything? A JUROR: Is the shuttle still running. It’s 6:00 o’clock. THE BAILIFF: It runs until 7:00. THE COURT: Thank you very much. Court is going to order a Presentence Investigation. I’ll schedule this for sentencing on December the 30th. Tate v. Maryland, ___ Md. App. ___ (Oct. 2, 2008). Clearly, Judge Moylan could not have meant that defendant Tate risked being convicted on either of the two counts for which the jury had acquitted him. After all, it is “settled that once the trier of fact in a criminal case, whether it be the jury or the judge, intentionally renders a verdict of ‘not guilty,’ the verdict is final and the defendant cannot later be retried on or found guilty of the same charge. And, contrary to one of the arguments advanced by the State in the present case, it is not necessary that final judgment be entered on the docket.” Pugh v. Maryland, 271 Md. 701, 706, 319 A.2d 542 (1974). Perhaps Judge Moylan meant that the only way for defendant Tate to have set up a sufficient inconsistent verdict argument would have been to have waived his right to the final verdict, and to have given the jury a chance to re-deliberate. ADDENDUM: I posted this blog entry to two criminal defense lawyers’ listservs, asking if anyone knows of any reason not to poll a jury. Around five answered, and none gave a good reason not to poll the jury, except for the one respondent who said the only reason is to stop hearing the word “guilty”. Thanks to those who responded, including the respondent drawing attention to the following Supreme Court case on the double jeopardy issue discussed in this blog entry: Smith v. Massachusetts, 543 U.S. 462 (2005).